← Born in the U.S.A.
“With the wonderful growth of Los Angeles as a great city has come to it many problems to be solved. The Owens River and the system of storm drains underway are the solutions of two important ones,” The Times says. 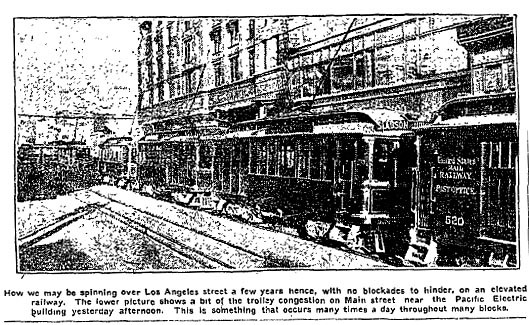 The Times says an experimental elevated line was underway from the Pacific Electric Building south on Tennessee with the idea of eventually linking to the beach cities. Someday an inquisitive person studying the history of transportation and urban planning will tell the world exactly what became of Los Angeles’ 1947 blueprint for dealing with transit problems. In the meantime, we’ll have to settle for the knowledge that at least they made a valiant effort. They certainly knew what was coming—without much argument, you could call them futurists. “High-speed rail transit arteries plus a system of downtown subways alone can save Los Angeles from disintegration into a hodge-podge of unconnected municipalities,” The Times said in quoting the project’s advocates. “Crux of this preliminary proposal lies in the immediate revamping of express highway projects (today we call them freeways) to include ‘center strip’ tracks capable of whisking trains at 35 to 50 mph. 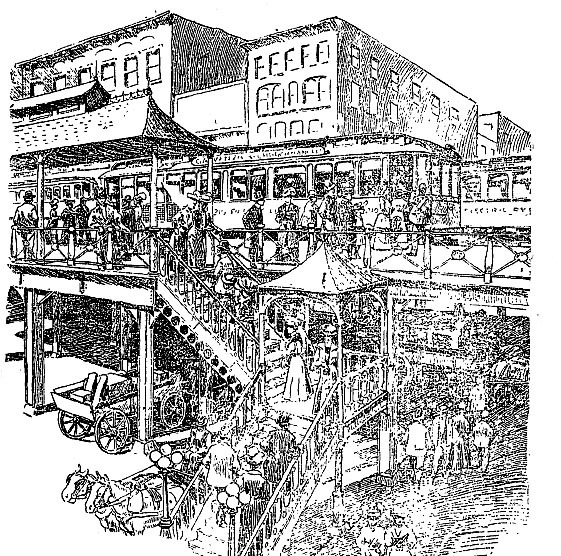 “These cars, pouring millions of commuters daily into metropolitan Los Angeles, would unload at special downtown stations whence passengers would be shuttled to local destinations by subways tentatively scheduled under Broadway and Spring Street. A quick search through Proquest isn’t helpful in determining the project’s fate. William Jeffers, the former Union Pacific railroad president who was to be a consultant on the project, is quoted in 1948 calling for approval of a rapid transit district. The original story reveals some obvious clues as to why: The Inglewood, Olympic and East Bypass Freeways aren’t familiar names these days. One could paper the dining room with Times maps of various freeway routes that were never built. (In simple terms, the Santa Monica Freeway was originally envisioned much farther north. To the south, the Olympic Freeway was to go from the Harbor Freeway to Venice and the Inglewood Freeway was to go from the Harbor Freeway to Sepulveda). And there are other stories in the same issue that offer more hints: A huge petition drive led by Ted Meltzer, publisher of the South Side Journal, against building the Harbor Freeway between Broadway and Figueroa. “Homeowners in an area bounded by 23rd Street and Imperial Boulevard claim that several thousand homes in the built-up area would be destroyed and ask that the project be either abandoned or postponed,” The Times said. And an adjoining story reports on a seven-month investigation of graft and conspiracy in acquiring property for the Hollywood Freeway. Bonus factoid: The Harbor Freeway was realigned to spare the Auto Club headquarters on South Figueroa and USC’s Fraternity Row. This entry was posted in 1907, 1947, Black Dahlia, Books and Authors, Downtown, Freeways, Hollywood, LAPD, Streetcars. Bookmark the permalink.